As the main family "Chef", I can honestly say that at least 5 nights out of 7, I ask myself "So, what should I make for dinner?". And it doesn't help when both our oldest, and hubby, have the same query when they respectively return from school and work. Being responsible for everyone's stomachs can be both daunting, and exciting. I've created some pretty amazing meals in our tiny kitchen, but some, well, not so much. This one here though, usually gets rave reviews. Save from the teen, who's all but refusing to ingest vegetable matter these days. 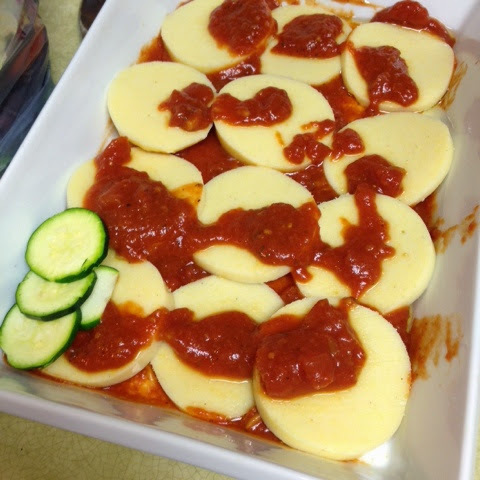 I've never seen this dish anywhere, so I'm going to go ahead and claim it as my own little concoction. It came about from having very little time to throw together a nice healthy meal, and trying to use what I had on hand. 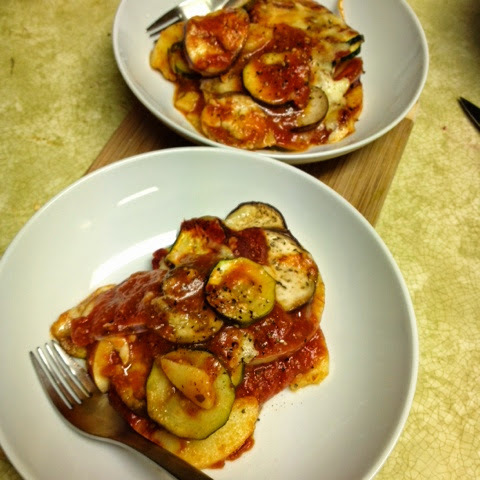 I've always loved Ratatouille, and lasagna, and this is a sort of mashup of these two. 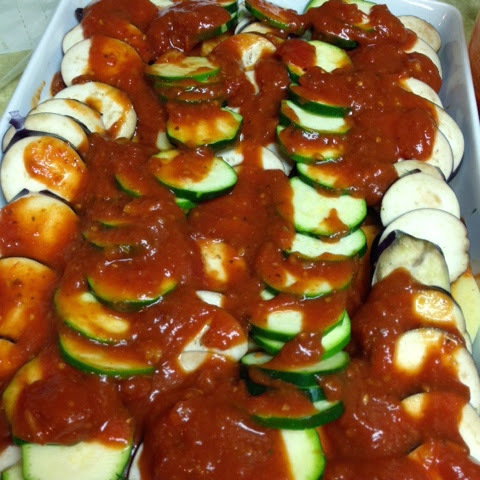 2 medium zucchinis and 2 Chinese eggplants, sliced. 1 pack of polenta (I use the 'log' type from Aurora), cut into 1cm thick slices. I used a ceramic casserole dish, about 9"x12". 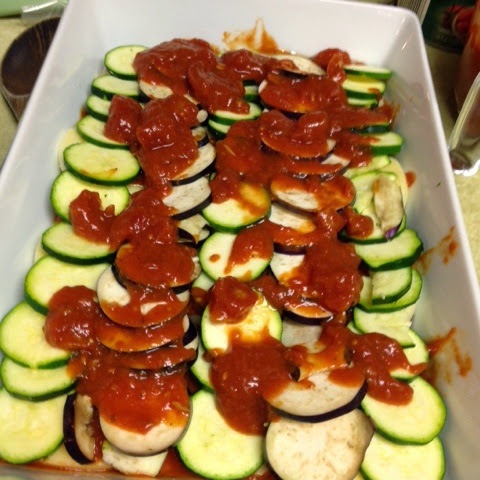 I start with oiling the bottom of my dish, and adding a splash of tomato sauce. 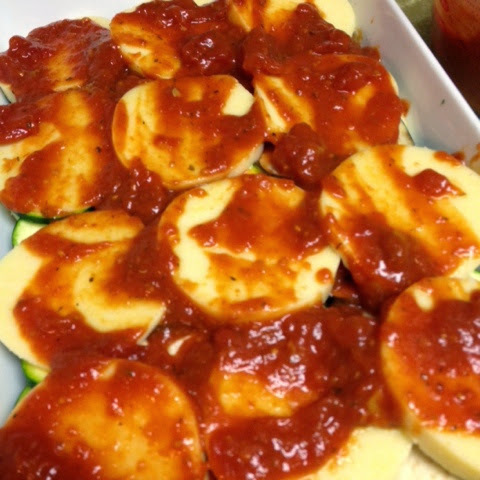 I then begin layering with the polenta rounds, add a bit more sauce, then start laying down neat rows of sliced eggplant and zucchini. 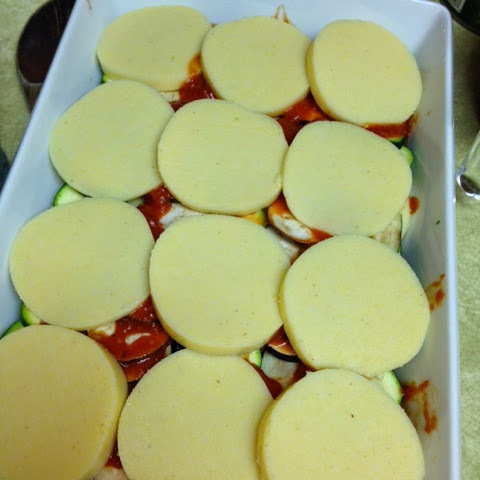 I like to add a bit of sauce in between each layer, just enough to cover, not drown the ingredients. 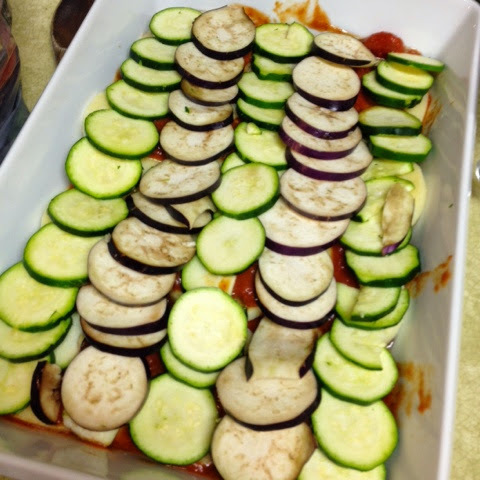 And you start again layering your ingredients, until they've all been used up. 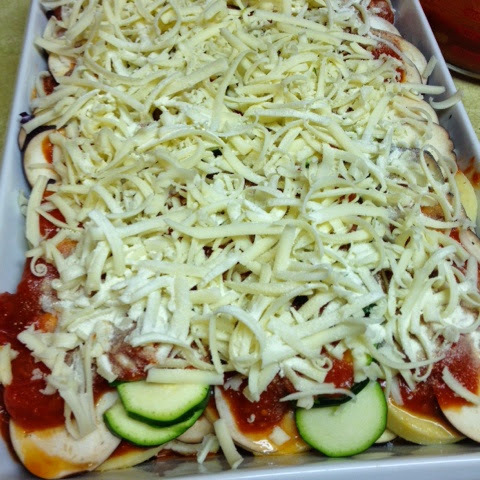 Then generously cover it all with your shredded cheese, add a bit of salt & pepper to taste, cover, and place in your preheated oven for 35 minutes. Uncover, and bake for an additional 20 minutes until the cheese is completely melted, and forms a lovely golden crust. 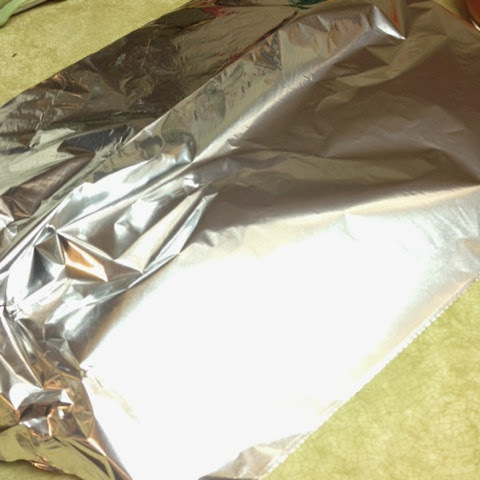 When using tinfoil to cover, tent it a bit, to ensure that it won't eat up all the cheese. Oooey Gooey crispy cheese perfection! I wish you could smell it! You can dole out and serve this on its own, or as a side with baked chicken breast, or a nice turkey meatloaf. 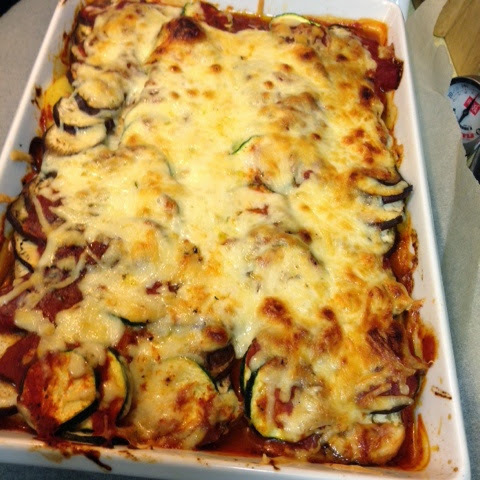 As with most casseroles and other saucy dishes, this tastes even better the next day. And from a dish this size, I could easily serve out 8-9 very healthy portions. 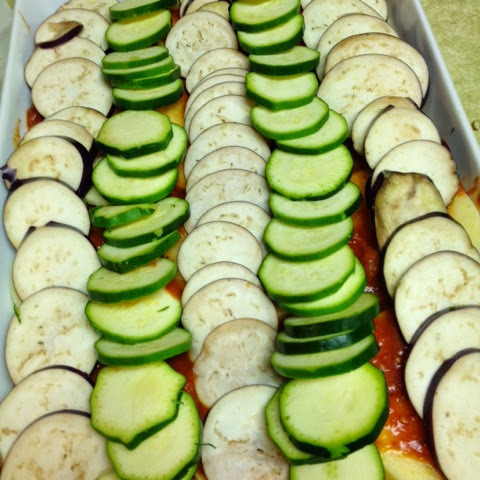 I love experimenting with this dish too, sometimes adding thinly sliced red onion, yellow zucchini, tomatoes, large eggplant slices. And different fresh herbs, like large sweet basil leaves, or marjoram, oregano, rosemary, summer savory, or thyme sprigs. The possibilities are endless!